With the cold weather just around the corner, I took a little time to make the B ready. First on the list was treating the rubber seals around the doors and windows. 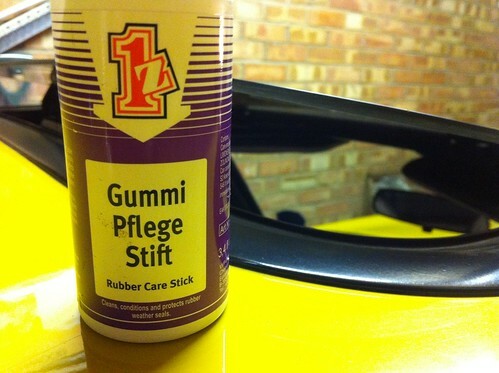 For this I got hold of some Gummi Pflege Stift to revive the rubber, hopefully improve the seal contact to reduce noise at speed and also help prevent them from sticking in the cold weather. It's not cheap stuff, but I couldn't find a bad review of it anywhere so thought it was probably worth going for this rather than another product which might not perform as well. Second up was taking a look at the rear screen demister. The wire on the passenger side has separated right at the window seal. This looks like it'll mean digging around a fair bit, so that'll be another post! Finally I needed to add some anti-freeze. I've been running without up to now - probably not recommended - but with a cold winter likely I thought it'd be best to add some. You need to be careful to get the right stuff - the newer type can affect the rubber hoses and you'll end up with leaks - I went with some from Halfords which came in at around £20 for 5 litres, plenty enough for this year. I decided to go for a 33% / 66% anti-freeze to water ratio, with the cooling system holding 12 pints, that meant I'd need to make 4 pints anti-freeze. As I knew my system was currently just water all I needed to do was drain off 4 pints of water and then replace that with coolant. The easiest way to drain the system is to pull the bottom hose off the radiator - remove the cap from the expansion tank and cap from the thermostat housing first to allow air in. I used a large plastic soft drink bottle cut off and marked up with measurements in pints sat under the radiator to accurately gauge how much water I'd drained out. Once I got to 4 pints I emptied the bottle and filled it with coolant. Back on with the hose and I filled up the system via the thermostat plug, carefully protecting the surrounding paint and alternator from any potential splashes. You have to do this pretty slowly as with the thermostat in place it takes a while to drain down and you can quite easily end up with coolant spilling over the top of the plug. Keep on filling until it won't take any more and replace the cap and the expansion tank cap. All this is in Haynes and it's easy to follow along in there. I ended up with around a pint still to add, so with everything back in place, I ran the car up to temperature. Once I knew the thermostat had opened, I shut it down and gently eased off the expansion tank cap to release the pressure (only open it to the safety!). The I added the rest of the coolant to the system, now the stat was open, keeping a little back to protect the expansion tank itself. Expensive, but hopefully the best stuff.